The waterway played a vital role in shaping the area's history. 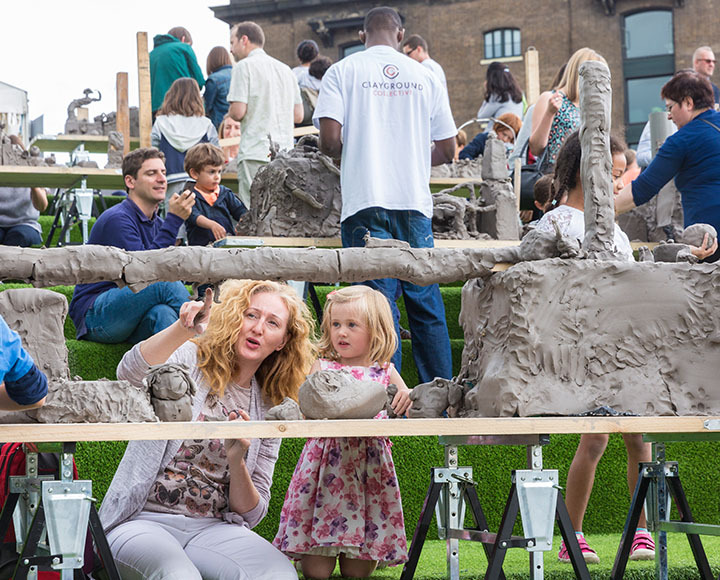 Once the tradesman's entrance to the industries that lined its banks, a new public realm has been delivered making it a place to be enjoyed by everyone. Improving access and re-establishing its importance as a route and a focus for biodiversity was a key goal. 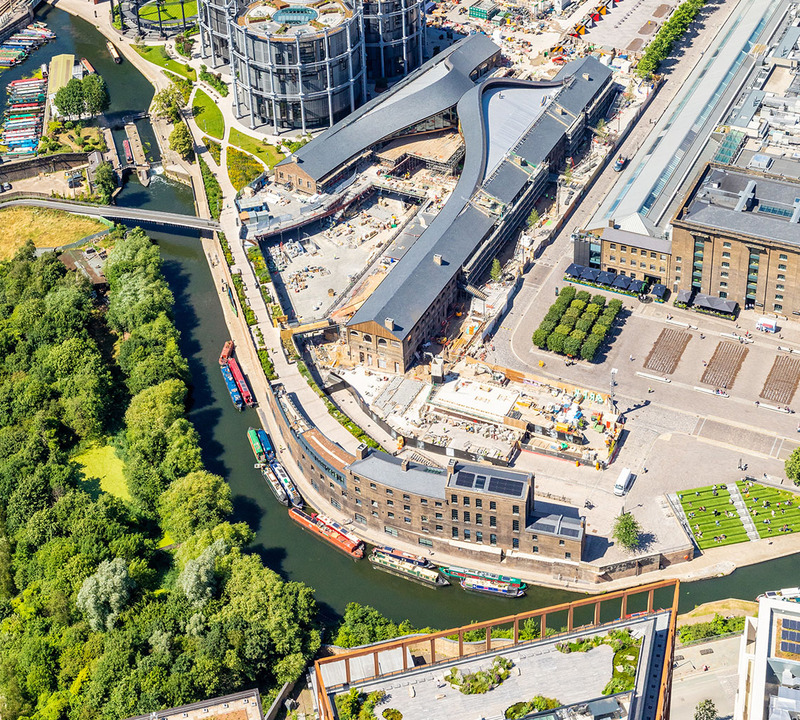 The Canal Corridor is part of the wider King's Cross redevelopment of 67 acres of redundant rail marshalling yards north of King's Cross and St Pancras Stations. 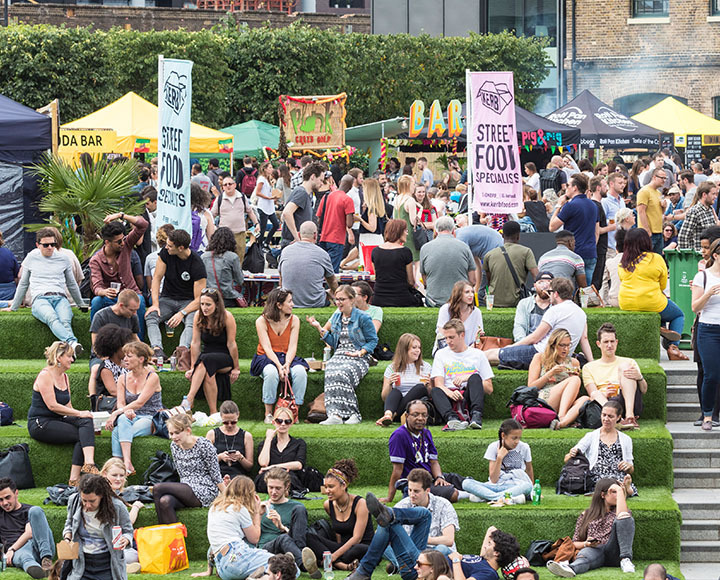 The King's Cross masterplan identified two key axis, the first, a north-south central spine extending from St Pancras and King's Cross Stations in the south, over the Regent's Canal, through Granary Square to Lewis Cubitt Park and York Way beyond. The second axis is an east-west link along the Regent's Canal connecting under the railway lines to Camden in the west and to the Maiden Lane Bridge and Islington to the east, forming the Canal Corridor. 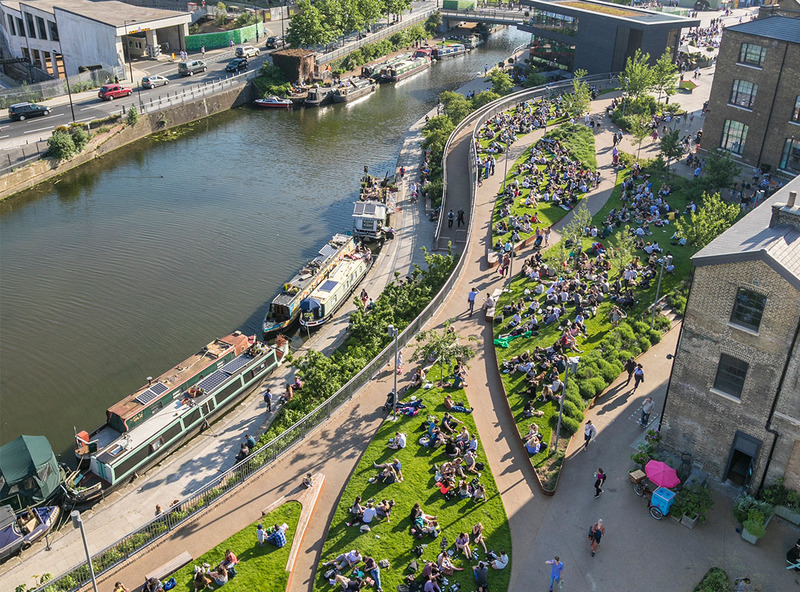 The Canal Corridor aims to celebrate the architectural heritage whilst improving access and re-establishing its importance as a route and a focus for biodiversity. The corridor has the most open aspect of anywhere at King's Cross and its south facing location means that the corridor receives sun throughout the day. Wharf Road Gardens - the sinuous landscape with undulating lawns running along the southern side of the Handyside Canopy to York Way. 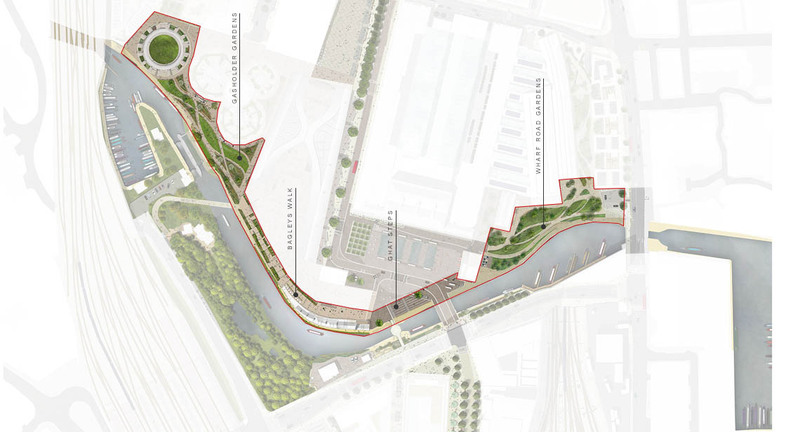 The towpath and Ghat Steps - a new canal path north and south of the canal with seating steps connecting the towpath and Granary Square. Bagleys Walk- the linear landscape running along an existing viaduct structure. Wharf Road Gardens, between Granary Square and York Way forms the eastern space along the corridor. 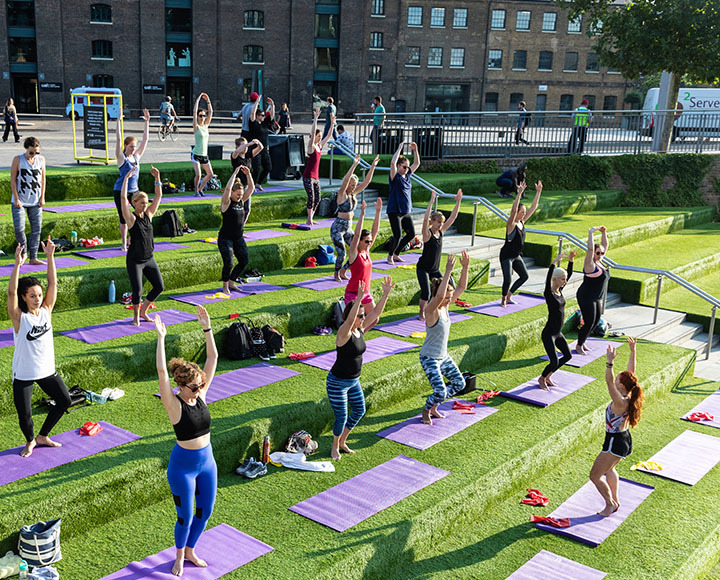 This space was envisioned to be a garden with gently sculpted areas of soft landscape, an intended contrast to the character of Granary Square to the west. The concept for the design took reference from the curved forms of the Regent's Canal as is twists its way through the King's Cross site. Pathways meander through gently mounded lawns and planting whose form echoes that of the landscape in Gasholder Gardens. At the western end a sloped route rises up from the towpath and emerges at the pavilion (The Lighterman restaurant) where there is also a lift access down to the towpath. At the eastern end, the steps to the towpath alongside the Maiden Lane Bridge have been refurbished. The widest route passes along the northern edge of the space, creating an offset between the soft landscape and the building line which includes the refurbished historic Midland Goods Shed, East Handyside Canopy and Regeneration House, home to the House of Illustration. Secondary routes flowing through the garden connect to this route giving access to more intimate spaces. 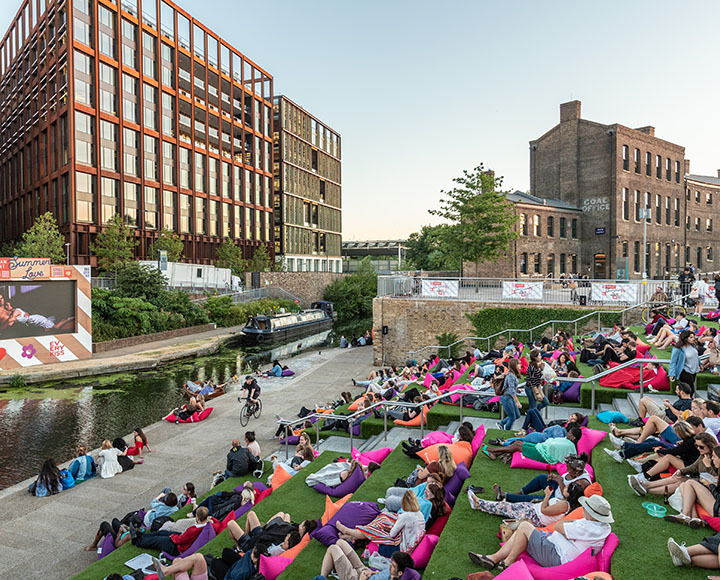 The southern side of the space is open, creating a visual connection to the Regent's Canal and an open view of the city skyline beyond. The design has maintained the openness of the views to the south with lawns abutting the canal side and trees and areas of planting concentrated to the northern side. 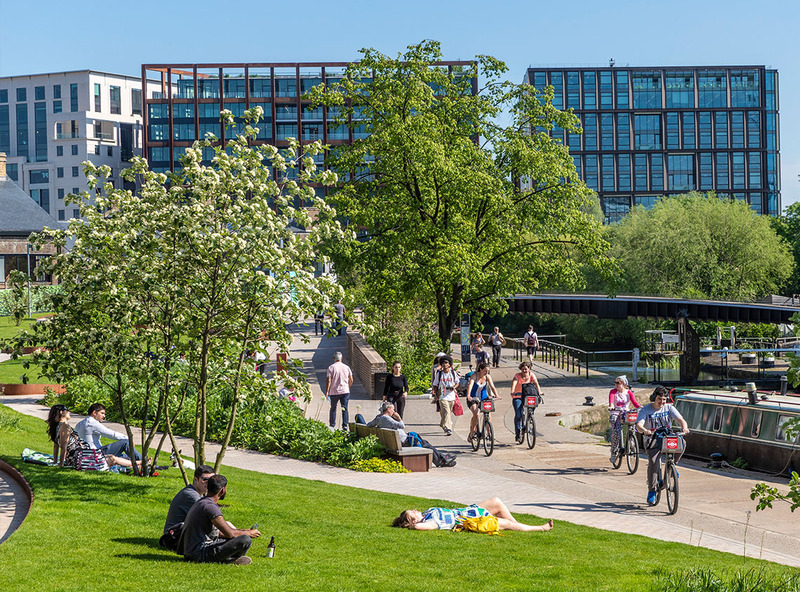 The pathways are surfaced with bonded gravel, creating a seamless connection northwards with Handyside Gardens, and a clear contrast with Granary Square to the west and the area for vehicles at the eastern end which both use stone setts. As the areas of lawn and planting rise up above the ground, a Corten steel edge is revealed, a reference to the historic industrial materiality of the site. Embedded in the tips of the planters are curved timber benches. The towpath runs along the whole northern edge of the Regent's Canal providing connections into Camden, Islington and beyond. 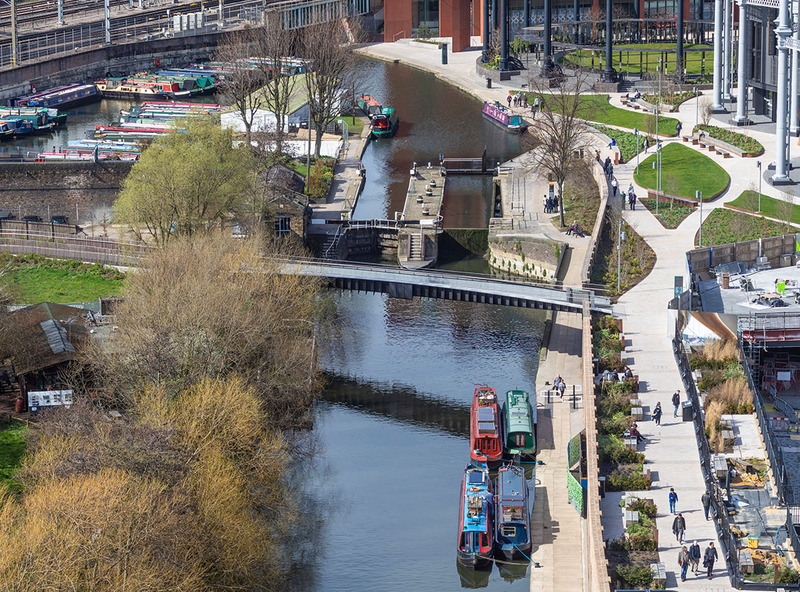 The works to the towpath have maintained the character and function of the route while creating connections into the site to the north, spaces to dwell, increased planting and increased towpath activity. Works to the wall along its northern edge included removing, realigning and repairing. Where there is new brick work, this has been carried out sensitively, using carefully sourced materials to blend in with the original wall. Further along to the east, the existing viaduct and Fish and Coal buildings and structures restrict the width of the route before it opens out again at the Ghat Steps where there is space for commercial moorings providing further activity. Ghat is a south-east Asian term for steps leading down to a body of water. 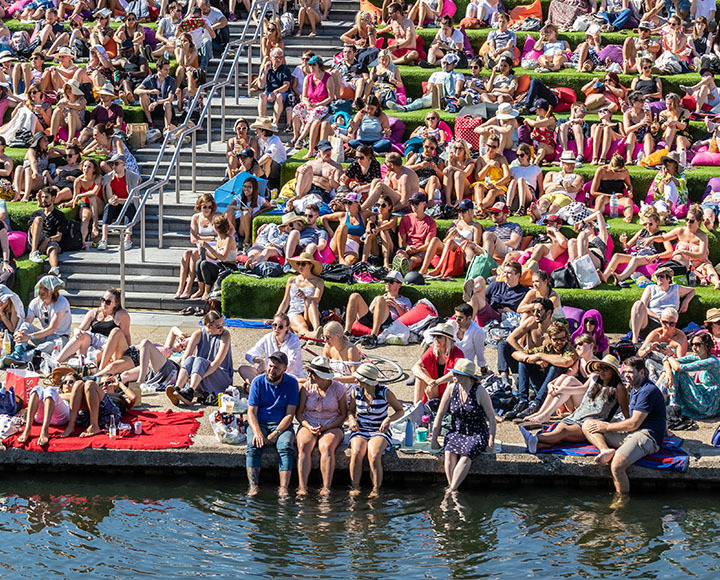 These broad south-facing steps sweep down to connect Granary Square to the Regent's Canal, offering eight levels of tiered seating. 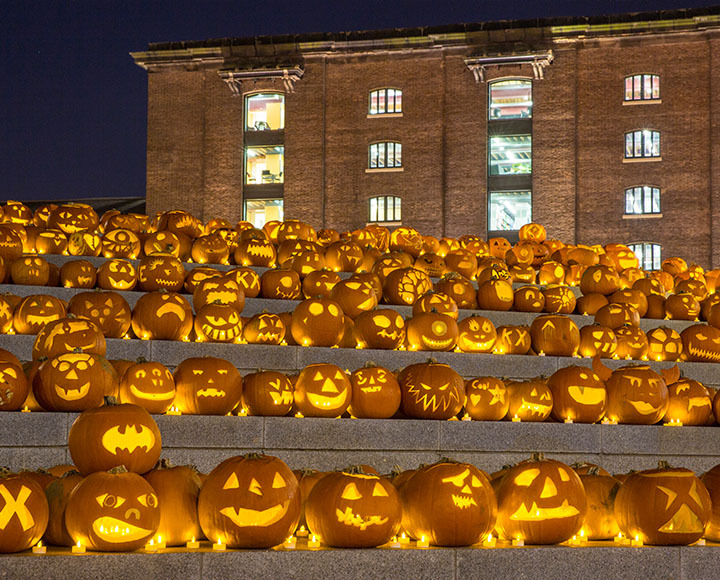 The steps form a natural amphitheatre space, which have hosted events such as outdoor arts, pumpkin carving and pot making for all age groups, early morning yoga, music recitals and cinema screenings. Since 2012 AstroTurf has laid on the steps each summer as a temporary seasonal furnishing. From the junction with the Somers Town Bridge, the Plimsoll Viaduct (renamed Bagley's Walk after the former nightclub) runs eastwards along the top of the Coal Drops Arches, to the Fish and Coal building where it slopes down to Granary Square. Designed as an elevated promenade, the route has been built as a central walkway with planting along the sides. The scheme was technically challenging due to the existing structure; the design was delivered with the constraints associated with existing structures- prescribed loadings and constrained construction depths. 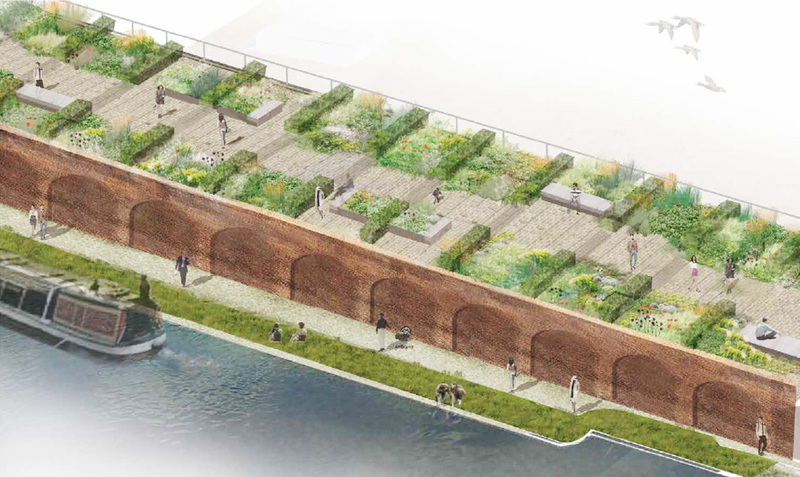 Along the length of the viaduct, pocket spaces have been carved into the planting to give people space to dwell and to reach the edges from where they can look down on the spaces below. The rhythm of the arches below is picked up in the lines of hedges and paving which cross the walk way. Planting design by Dan Pearson Studio, celebrates the seasons and at the eastern end includes a number of edible species. 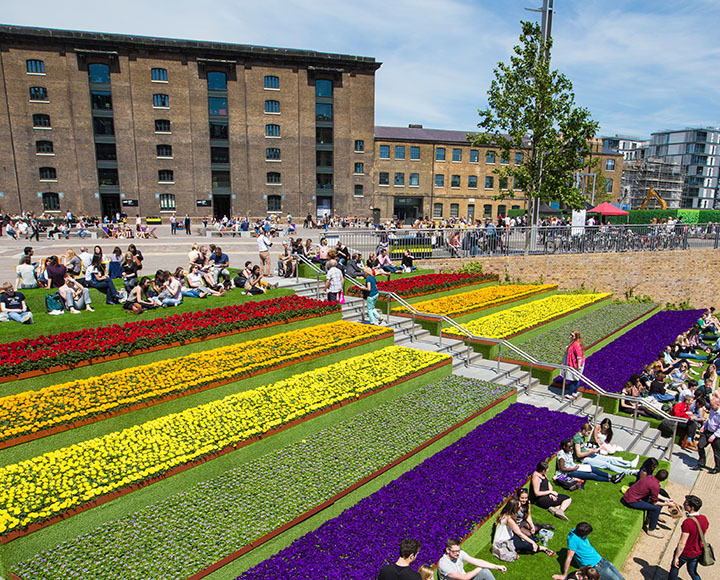 Alongside the Fish and Coal building, where build-up depths are reduced, and the space narrows, planting is within planters to enable the greenery to extend to Granary Square. 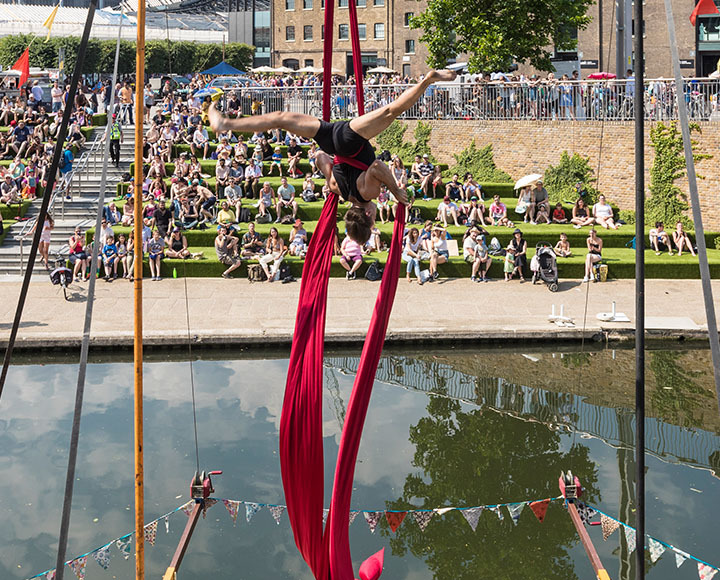 Taking its name from the restored Victorian gasholder guide frames within it, Gasholder Gardens is a flowing landscape, gently rising from the canal towpath in the west up to the new Somers Town Bridge to the east. Pathways weave through the park, as ripples against the gasholders, defining pockets of soft landscape. 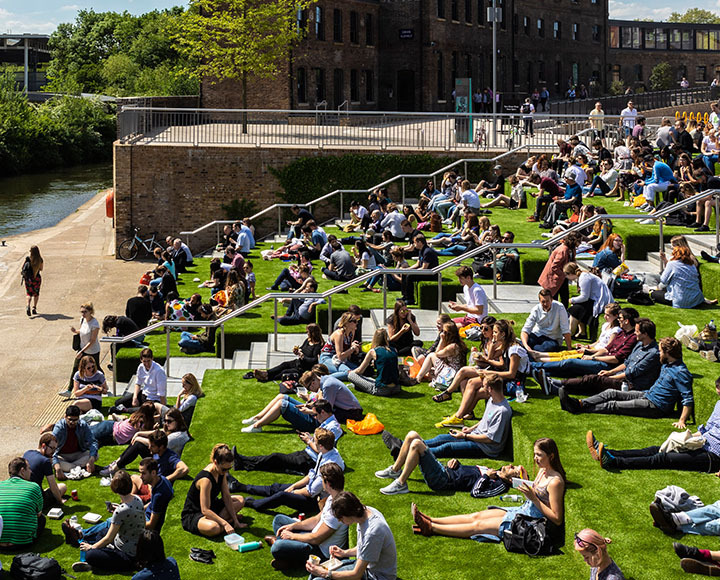 Free from overshadowing, the site basks in sunlight which has been embraced in the design - as the site steps away from the canal, the levels rise, creating sloped lawns facing the canal. Paths in granite stone create a visual extension to the canal side and give access into the King's Cross site beyond. Corten steel edges the planters, a material used to reflect the industrial character of the history of the site and to bring a flash of colour into the scheme. The planting design by Dan Pearson Studio plays with textures and colours with an overarching emphasis on yellow tones in the flora. 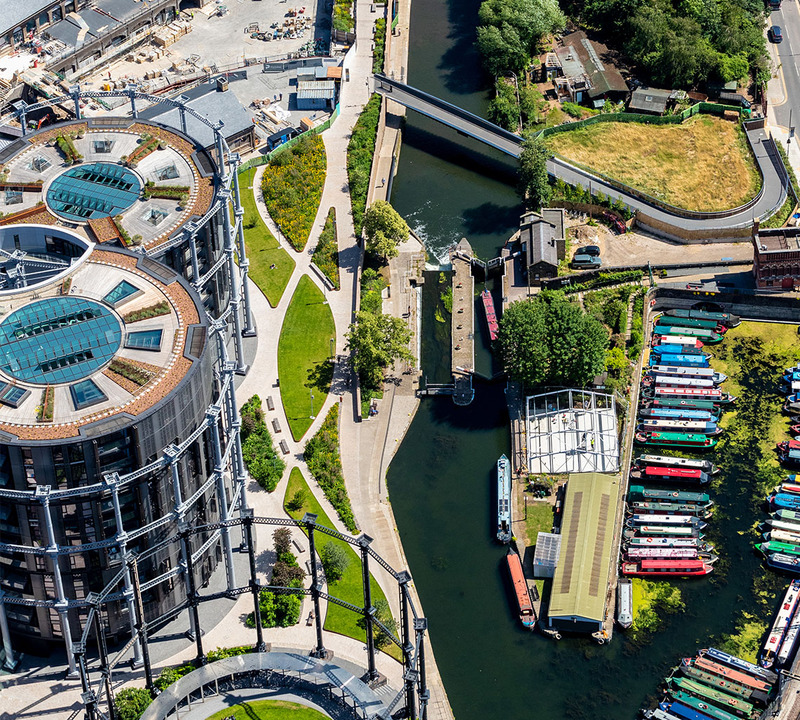 Within Gas Holder #8, a more formal landscape has been created by Bell Philips Architects, winners from a design competition in 2008 to remodel the Grade II listed gasholder as a new public space.